IPL 2019: Well, was it fake or real? 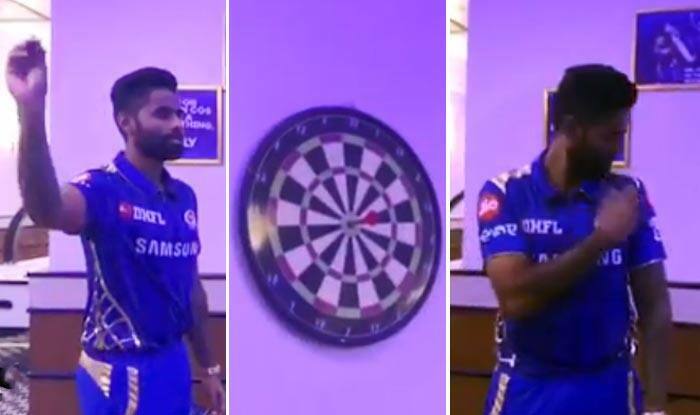 IPL 2019: Suryakumar Yadav stunned his fans with a no-look bullseye away from the cricket pitch. He was playing darts and he attempted the impossible. Without taking a look at the target he got it bang on. The dart hit the middle of the board. After the miraculous shot, Surya flaunted it with expression fans would love. Mumbai Indians beat defending champions Chennai Super Kings in their last match and are a unit brimming with confidence. Suryakumar Yadav has been in good form during the league. He already has amassed 117 runs in five games at a strike rate of 134.48. Meanwhile, Mumbai will now lock horns with Kings XI Punjab at the Wankhede on April 10. Suryakumar Yadav is expected to play an important role in the game. In the last game, young Alzarri Joseph bagged a surreal six for 12 runs against Chennai, making his IPL debut.